Cary, NC — Next week will be bittersweet for Cary’s International Ballet Academy. Five of their star pupils are moving to ballet placements around the nation, some as far away as Seattle. Cy Doherty, the only young man in the group, will be traveling to practice and learn at the Harid Conservatory in Boca Raton, Florida. Madeline Clark and Savannah Raynor will live in Pittsburgh to practice with the Pittsburgh Ballet Theater School. Nikki Fanney will study at Houston Ballet Academy, and Anissa Bailis joins the Pacific North West Ballet in Seattle in their professional division program. The dancers will train at these schools, many of which are associated with professional ballet companies, in hopes of gaining a spot within the corps. If that doesn’t work out, these schools can also connect them to other professional companies where they may be hired to dance. 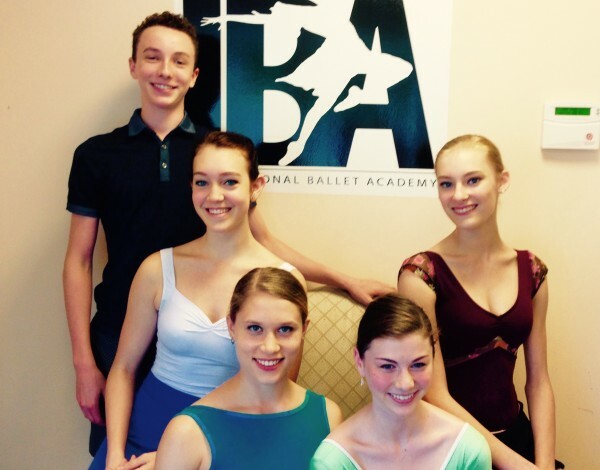 Cary’s International Ballet Academy, or IBA, formed just over five years ago. As they start their sixth year, owner Christina Fanney, who is also Nikki’s mother, is thrilled to send off five of their students to advance to the next level in their dance careers. I asked the dancers how they managed to gain these positions. Nikki, Cy and Anissa received offers while performing at a national level competition. Savannah attended winter auditions and was offered a position at the full-time school. Madeline attended a summer program, and, from that experience, was offered to take classes at the Pittsburgh school in April. That shaped her decision to go there to study full-time. Anissa’s professional program prefers dancers to be done with high school, because they will be in ballet classes during the day and follow that with rehearsal, so there’s no time for school. The program provides a great transition between the school and the company. The amount of work is like having a job, “Except that you don’t get paid. In fact, you pay to go,” or have a scholarship arrangement where tuition for classes are covered. Anissa said this step in her career is a great transition from high school to joining a company. The other students are all considered high school seniors and will be either taking class with their ballet schools or taking classes online. Of the five, Cy is the only one currently attending a traditional Wake County school – the rest have been home-schooled and are familiar with taking online classes. If some of these names sound familiar, it’s because we have written about these students’ performances in the recent YAGP dance competition. Anissa, Cy and Nikki placed very well in the Youth America Grand Prix (YAGP) semi-finals in New York this past January and went on to the finals in April. Madeline also danced in this competition in the past. Each student received bids and offers for scholarships which will help offset the costs associated with studying at these schools. All will be working right through Thanksgiving, Christmas and New Years as they perform in each of their company’s Nutcracker holiday performances. Until then, we wish them the best of luck in their new endeavors.